Apple Inc. is offering employees affected by its stock option fiasco the opportunity to amend past options. Meanwhile, Steve Jobs has seemingly been cleared of any wrongdoing in Pixar's own stock options mess. And Adobe plans to team with several high-profile Apple retail stores for demonstrations of Creative Suite 3.0. In wake of its option-backdating fiasco, Apple is offering affected employees the opportunity to amend past options and receive cash payments for such eligible options in an effort to avoid tax penalties. The Cupertino-based company made the announcement in a regulatory filing with the Securities and Exchange Commission on friday, explaining that some of the misdated stock options exercised after 2005 are now subject to additional taxes. In an ensuing email to employees, which can be seen in full at MacNN, Apple informed affected employees of an optional plan that would allow them to avoid such penalties. The offer, which expires on April 16th, 2007, reportedly covers a mere $67,142 worth of options. Meanwhile, Walt Disney on Friday announced that it found instances of stock-options backdating at Pixar before the animation studio was acquired, but concluded that no one currently associated with the Company engaged in any intentional or deliberate acts of misconduct. The company's Audit Committee and Board said that Disney will address the additional income tax liability issues facing Pixar employees who hold such options, including participating in programs established by the IRS and the State of California to facilitate the payment of such taxes on behalf of employees. The statement appears to clear Disney Board member and Apple chief executive Steve Jobs of any wrongdoing during his tenure atop Pixar's executive branch. Adobe announced late last week that it will team up with Apple to present Creative Suite 3.0 (CS3) at Apple stores in several major cities on March 28th, the day after it unveils the next-generation software suite at a gala event in New York City. 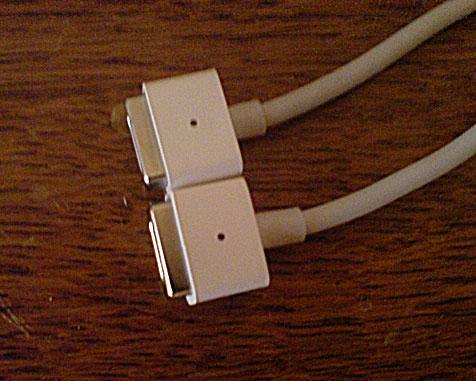 An AppleInsider reader who recently had his MacBook's MagSafe Power Adapter replaced due to a frayed lead discovered that Apple has made some quiet improvements to the strength of plastic insulator where the chord meets the magnetic connector. The above photo shows a MagSafe connector purchased with a MacBook Core Duo last May (top) and the updated adapter now shipping with newer system.